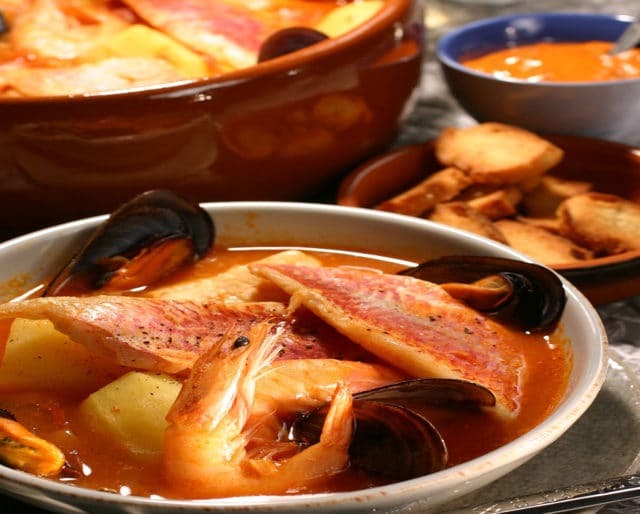 Happy National Bouillabaisse Day! Now say that three times fast. If you can’t, it’s okay — you can still have fun and enjoy this French stew on December 14. Bouillabaisse traces its roots all the way back to ancient Greece, and has made its way to the U.S. with many variations, including simpler versions. The main components are fish, including eel and shellfish, vegetables, and the broth. What makes this stew unique are the herbs and spices. Also, the broth and fish are served separately, accompanied by sliced bread with a rouille spread (think garlic mayonnaise). Bon appétit! Restaurants started serving bouillabaisse to the upper class. Tomatoes are added after being introduced from the Americas. Celery, onions, and potatoes are also added. The legend of the bouillabaisse's beginnings started in ancient Greece. The fishermen of Marseille, founded by the Phoceans, created the dish because they wanted to make a meal when they returned to port. If you like seafood, consider making the dish to celebrate the day. Find a simple recipe or take on the challenge of a fancier version. Either way, we're sure you'll have fun making the stew and enjoying the results. Look up restaurants nearby that serve the stew and pick as many as you can for your own taste challenge. Bonus points for supporting local businesses. Learn the mythology behind it. While bouillabaisse originated in ancient Greece, a similar dish also appears in Roman mythology: it's the soup that Venus fed to Vulcan. 5 Types Of Fish Used Make Bouillabaisse. Velvet crabs can make their way into this stew as part of the shellfish component. The largest of the swimming crab family, it can be found in the western parts of the Mediterranean Sea. French for red rascasse, it's a spiny Mediterranean rockfish. A white rascasse can also be used for the stew. A grondin, or sea robin, can sometimes replace the rascasse. They're a family of bottom-feeding scorpaeniform fish. This is a kind of eel. Its head is sometimes used for the stew. Baudroie, or monkfish, are typically found in the Atlantic and Indian Oceans. They can grow to be over five feet long, though the average size is about three feet. By celebrating this popular Mediterranean dish, it reminds us that even learning about a recipe can bring us closer to other countries regardless of the oceans in between. Whether it's giving this dish a taste or buying all the ingredients to make something new, this day helps us get out of our comfort zone. If you want to avoid chicken or beef for a day, this stew, which incorporates at least four types of fish, is the savory solution. Celebrate by learning how to make it, and then, cook some whenever you get a craving for seafood.